"Cleanliness is next to Godliness" is the beautiful proverb which should be remembered by everyone in their daily life. This proverb makes us to understand how cleaning habit can make our life beautiful . I have seen many people who keep their home clean but make the place dirty when they are outside. Isn't it they have a selfish behaviour. Why people cannot be same when they are outside their home ? Few days back. After a very busy schedule,I and my friend thought we need to relax and treat ourself So decided to go to the mall for shopping. There we had a lot of fun and thoroughly enjoyed the time. When we were out of the mall to return back home. I was happy to see how perfectly all the vehicles were parked and lighting, music outside the mall was so nicely managed. But one thing I could not take my eyes off was from the dirt that was making the surrounding untidy. There were many dustbins which were at every single corners of the mall. But no people bothered to take bit of trouble to throw the dust in the dustbin. All were happy to put the dust right under their legs. I was getting disturbed. I wanted to burst on those people who were making the surrounding untidy. I said to my friends why these people behave like animals. Don’t they have a sense what they are doing? Why can't they stop themselves for making the clean place into unclean area? Whether they do it same in their home? My friend had no words to say but tried a lot to keep my mouth shut. I told her this is not the time to be silent, we need to raise our voice to clean the places. We both had a long conversation and ended with no solution. But I promised myself the very next time when I see such thing. I am going to fight for it without any help. Next day evening, when we were out for walking. I found a man who was cleaning his car and throwing all the dust, biscuit wrapper and waste tea cups on the road instead of packing them and throwing it in dustbin. I said to myself. This should be my first step to keep our country clean. So I went near him and with high voice, I asked that man " Is this the place where you throw the dust?". Don’t you see the dustbin right front of you?Why are you not throwing there? The man in returned replied me why I should listen to you? Is this your property? I said him yes, this is my property and my country. I will keep it clean and also make others to keep it clean. The couple who were besides me also started scolding the man and big crowd was formed. The man was ashamed of himself and was trying to hide his face. He had no other chance to do only he could do was to collect the waste and throw it in the dustbin. After seeing the change in the man .I was happy and satisfied for taking my bold step. The lovely and the supportive couple appreciated me for taking the right stand for right cause. So friends, there is no harm in fighting for a right cause. If each one of us can contribute this stand in your own place we can make our Bharat (India) into Swach Bharat (Clean India). This post is the part of strepsil India campaign #AbMontuBolega hosted by Indiblogger. 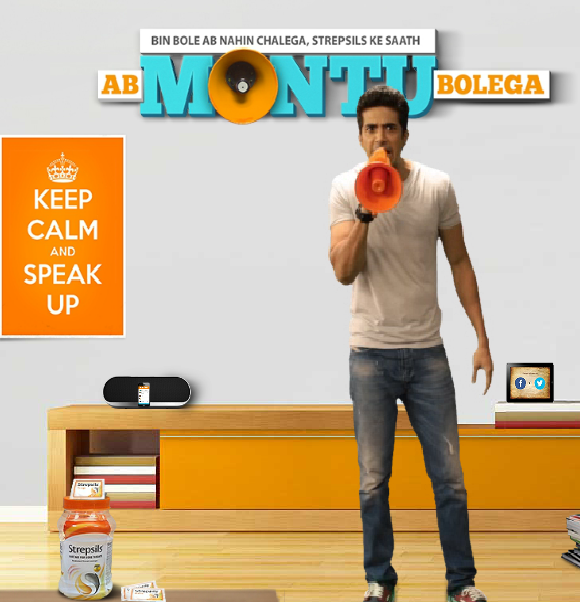 #AbMontuBolega campaign gives the power of voice to clean our country India. There are places that need cleaning, people who deserve your attention & authorities who need to hear your opinions! Don’t be a silent spectator. Raise your voice and make a difference.